Italian Sausages both sweet and hot make for the basis of a no frills dinner. With well seasoned Broccoli Rabe, Cannellini Beans with diced Tomatoes, or a well sauced Pasta, the Sausage enhance the plate and please your palate. 1. Pierce the Sausages with a fork. Heat a large pan & add 1 TB of EVOO & the Sausages, Saute until brown & cooked through. The internal temperature should be no more than 140 degrees, so they won’t be dry. RECIPE Broccoli Rabe With Toasted Garlic. Of all the bitter greens that we enjoy, we most seem to gravitate to Broccoli Rabe. First off it’s easy and rather quick to prepare compared to some of the others. Kale, Collards, Escarole and Mustard are just a few examples of long cooking greens. 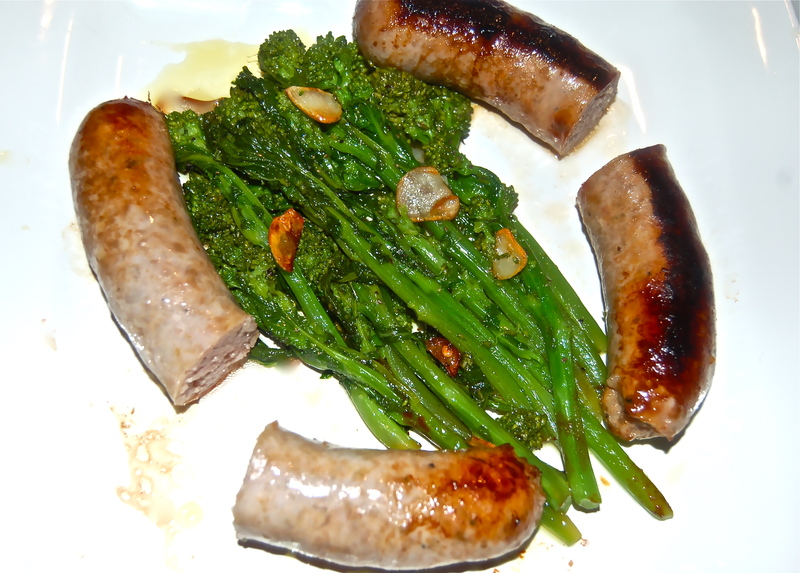 To us Broccoli Rabe’s natural plating partners are sweet and/or hot Italian Sausages. So for a no frills dinner of good tasting food, opt for this combination. 1. Wash & trim about 1″ off the bottom of the Broccoli Rabe. In this recipe I separated & discarded the large leaves (this is optional & actually unnecessary, the leaves are extremely tasty). Peel away the rather tough skin from the Broccoli. 2. Heat a large pot with a few inches of water, place the Broccoli Rabe on a steamer rack steam for 6 minutes. Drain & place them on paper toweling. Thinly slice the Garlic cloves. Red Pepper Flakes (to taste), & saute until beginning to color. Remove to a small bowl. 4. Add the Broccoli Rabe to the Garlicy EVOO & gently toss until well coated. Return the Garlic to the pan.